The coupling reaction of terminal alkynes and CO2 provides a promising way to synthesize propiolic acids. 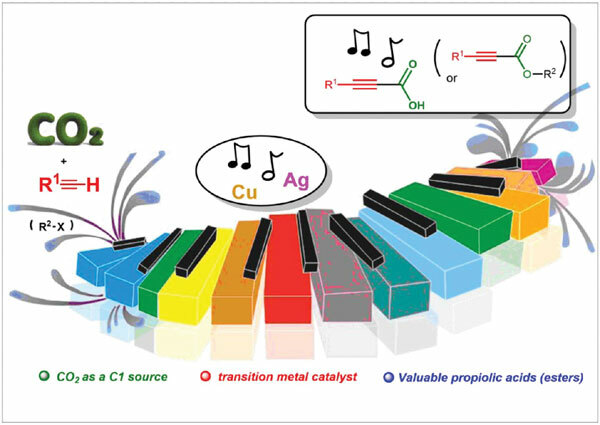 Among the existing catalytic systems, transition-metal copper and silver exhibit excellent catalytic efficiency under mild conditions probably being attributed to the activation of C-C triple bond of terminal alkynes. In this aspect, efficient strategies for activating both substrate and CO2 are often smart choices. This review summarizes the development trend of the Cu/Ag-catalyzed carboxylation reactions of terminal alkynes with CO2, and representative examples are also discussed in detail. Carbon dioxide, carboxylation, terminal alkyne, propiolic acids, transition metal, catalysis.